This CR is long overdue. The fishes cot was in last quarter of 2004. My fren recommended this place, Nicoll Highway, Kallang river. 1st time there I lost 2 biggies 1 alimost pulled my 7ft rod into the water was using live mullet as bait, 12ft rod also lost another fish live prawn was used. Managed a consolation of small flathead which was cnr. 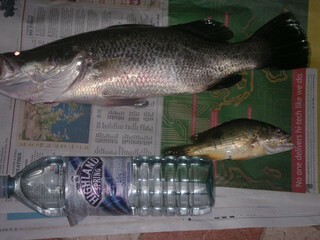 Went back 2 weeks later armed with 7 and 12ft surecatch fishing rod bait was live mullet and prawns and dead pasir pasir. Expectation was high after the 1st encounter. Reached the place ard 9pm. Lots of water activity, landed the ack abt 30min later. Changed the bait (live prawn) cast out b4 could put down the rod there was a tug. I then set hook the ack gave a pretty good fight though. 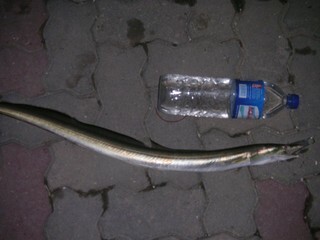 Abt an hour later decided to use the 12ft rod to target stingray, threaded fresh pasir pasir through the hook attached to steel wire than in turn attached it to langong. Cast it out then around 10 mins later the tip of the rod started to bend tot it was some crab or small fishes having free meal. 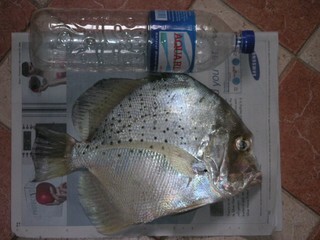 My fren asked me to check on it and behold my 1st wild KBL , it actually swallowd the whole swah jiam! Must be damn hungry. Went back few times subsequently, better at nite bcoz daytime canoeists and I feel like toll station lifting the barrier(fishing rod) whenever they pass. Enjoy the pic, cao xi cot in the day using dead prawn and the ferocious malong on live mullet. It almost swallowed the whole mullet except the tail then when I brot it up it spat the whole mullet out wat a sight. Tightlines!